…Of the Half Marathoner’s Club! 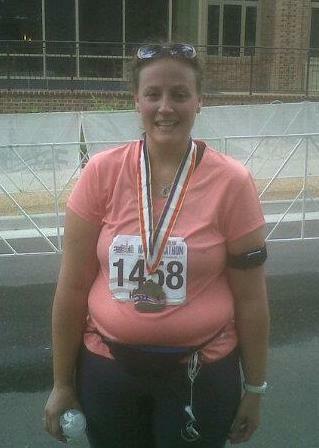 On May 20th, I ran my first half marathon in Williamsburg, Virginia. The race was what set the wheels into motion for our road trip vacation. I mentioned before that I always wanted to go to Williamsburg to see where our great country was founded, but there was always some reason I couldn’t plan the trip. Back in September, Kiddo was studying the American Colonies in school. Nate and I were reviewing his schoolwork and discussing how we had always wanted to visit Williamsburg and Jamestowne. I kid you not, the very next day; a friend of mine from MyFitnessPal (MFP) asked me if I would be interested in running a Half Marathon in Williamsburg. Coincidence? I think not. I took this as a sign and after discussions with Nate, registered for the race. The morning of the Run for the Dream Half Marathon was sunny with temperatures in the 60s. The few days prior to the race were hot and humid, so it was nice that the weather decided to cooperate on race day. Nate and I arrived at the start line area early and met up with the two friends from MyFitnessPal who were also running the race. We had time to chat and hit the restrooms before runners were asked to find their corrals. After an adorable kindergartener sang the National Anthem, we were off. I ran with one of the MFP gals and we had a wonderful time chatting as we took in the sights. Running through Colonial Williamsburg, there were military personnel stationed at several corners, cheering us on. How humbling that these people risk their lives to protect our country, rights and freedoms, yet they gave their time to cheer us on for the race. The race itself is a fundraiser for Wounded Warriors and was very patriotic. Being in America’s birthplace, surrounded by American flags and soldiers made it hard to hold back tears of gratitude for simply being able to run when and where we choose to; a liberty that people in other countries don’t necessarily have. 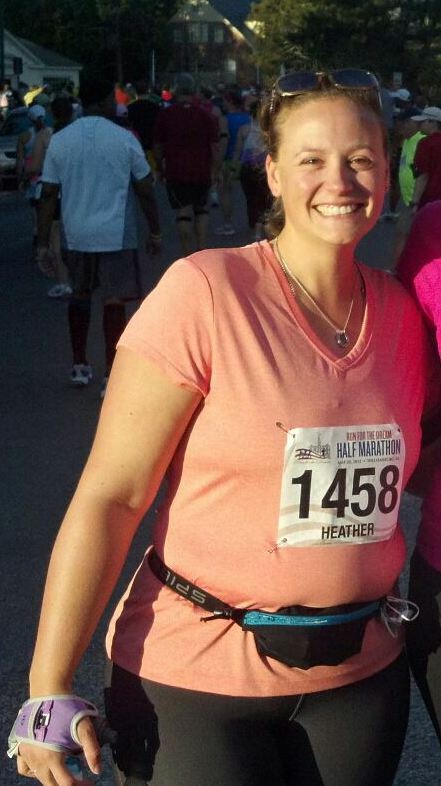 I learned after the race that my rear appears perky when running…who knew? The entire course was gorgeous. We started by winding through Colonial Williamsburg, then headed out to the tree-lined rolling hills of the Colonial Parkway, and ending in the stadium at the College of William and Mary. My running buddy and I ran the first several miles, walking only through the water stops. At mile 6 or 7, we stopped for a bathroom break and were on our way again. We continued our method of walking through water stops and occasionally walking after an uphill portion. We also snacked on Sport Beans as we ran, hoping that would give us the energy to make it through to the finish line. Around mile 10 or 11, we parted ways; I was running low on energy and she felt like she had a lot left to give. After she sped ahead, I slowed down to a slower walk/run pace, which I continued until just outside the stadium. Right after mile 10, my body started to hurt. My left arch felt like it was cramping and my left hip was angry with me. None of the pain was unbearable, but it did cause me to do a lot of walking in the last two miles. When I was finally behind the stadium, I was able to hear my friend’s name announced. I was so proud of her for putting in the training miles and finishing strong. Just as I was (finally) about to enter the stadium, I spotted my friend and her family, who cheered me on. Entering the stadium was very emotional for me; something I didn’t quite expect. The Olympic theme was playing and there were kids lining the track, clapping and shouting encouragement. I started crying, which meant I couldn’t breath and couldn’t see. I’m sure the kids thought I was crying from pain, but it was the thought that I was about to complete 13.1 freakin’ miles; something I never in my like would have imagined me doing. All of the running and life changes leading up to that moment were flashing through my mind and I was incredibly proud of myself. I wiped my tears the best I could and told myself to focus on breathing so I could make it to the finish without passing out from lack of oxygen. Next, the announcer said something along the lines of, “Hurry up, Heather. You’re fiancé is waiting for you. Aren’t you ever ready?” It made me laugh and start running faster. I spotted Nate in his bright green jacket next to the emcee. Surprisingly enough, I still had something to give and sprinted the last leg of the track, crossing the finish line in 2:46:07. It wasn’t as fast as I’d have liked, but considering I trained on a whopping 4 miles per week, I couldn’t have asked for more. I was dead tired, but happy to have taken on the challenge and complete it. Demonstrating how I felt after the race. In the weeks since the race, organizers have determined the course length was actually almost 0.4 miles too long, so adjusted results were sent out, making my official finishing time 2:54:51. I had hoped to finish closer to 2:45, but again, given my lack of training I’m pleased with my time. The entire experience was pretty amazing. Meeting two awesome women from MyFitnessPal who I can honestly call friends, running my first half marathon and visiting Williamsburg are experiences I won’t ever forget. Even better was having Nate there for it all. Thanks for your support, honey! CONGRATS on your half marathon!!!! Girl, I am SO proud of you. I actually got a couple tears in my eyes reading your recap!! Love how your Nate got the announcer to say something special for you!